Today I want to write about a very beautiful bird, the greater flamingo. These elegant birds grow to about 145 cm tall, making them the tallest flamingos in the world. Greater flamingos feed by wading through water with their heads upside down, using their beaks to filter food. They eat small crustaceans, molluscs, worms, insects and small fish as well as some plant matter. Younger flamingos are very white and they get pinker as they get older. They get the pink colour in their feathers from the food that they eat. At breeding time, they have amazing courtship displays, with hundreds of them dancing, stretching their necks and preening their wings at the same time. They make a nest out of mud and lay a single egg. A couple of weeks after hatching, the chicks go into a large creche with thousands of other chicks. Amazingly, the mums can recognise the calls of their own babies. Greater flamingos have the largest range of any flamingos and can be found in Africa, southern Europe, the Middle East and parts of southern Asia. They can be found in flocks of up to 200,000 pairs. 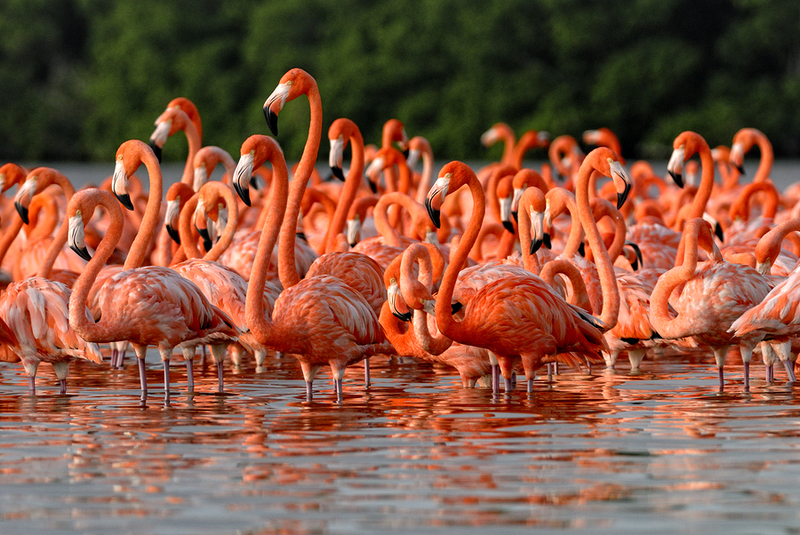 Are there any other interesting facts that you would like to share about greater flamingos?